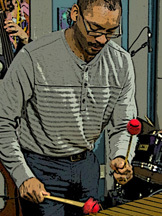 Jason Marsalis is the youngest member of the famous New Orleans Marsalis jazz musical family. Besides being a great drummer, he is also a great vibraphonist as he will show on this gig. Gives jazz history observations throughout. His recent release, "The 21st Century Trad Band" is a follow-up to last year's successful release of "A World of Mallets."